•Careless digitising or automated processing can create polylines that overlap. Such polylines do not cross each other, they overlap, and consequently are impossible to identify visually. You can think of these as a smaller polyline following the exact route of a longer polyline. The difference between this scenario and double digitized is that double digitized are often not exactly overlapping they can weave over each other. An overlapping polyline follows exactly the route path of the longer line and they typically share a node (usually downstream end). •RivEX has to test every polyline with every other intersecting polyline so this a time consuming task, for example a network composed of 250,000 polylines will take about 20 minutes to process on a fast computer. •The error log file will list all the polylines found to be within other polylines. You would use this to review and typically delete out the smaller polyline. This may not necessarily correct the tributary junction. 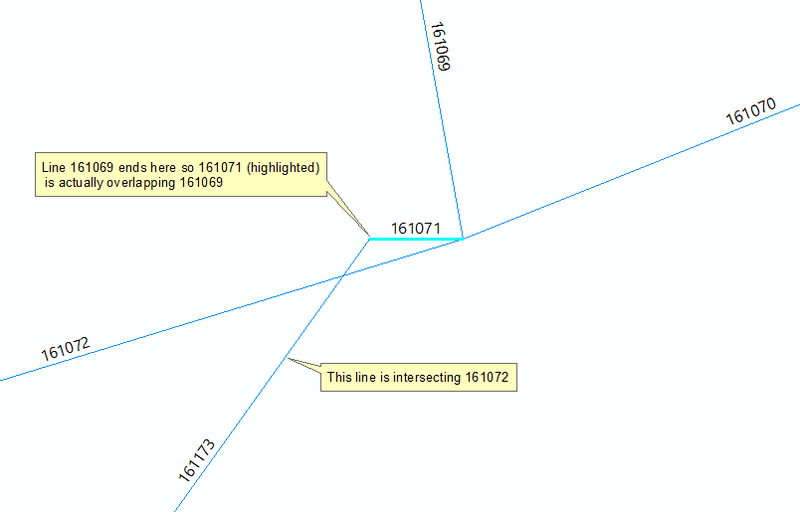 In the image above if the highlighted line was deleted it would remove the overlap but would not resolve the fact that remaining four lines do not connect at a single node. In rare cases this may be what you want as what you are looking at is a aqueduct scenario.